Coors Field is the site of the matchup between the Miami Marlins and the Colorado Rockies on Monday, September 25, 2017. The probable starting pitchers are Odrisamer Despaigne for the Marlins and Tyler Chatwood for the Rockies. Miami opens at +160 while Colorado opens at -170. The Marlins have a 80-63-11 over/under record and a 78-76-0 run line mark. The Rockies are 78-77-0 against the run line and have a 62-86-7 over/under record. The Marlins have a 73-81 overall record this season. Starting pitcher Odrisamer Despaigne has a 0-3 record with an earned run average of 4.37 and a WHIP of 1.46. He has 22 strikeouts over his 45.1 innings pitched and he's given up 43 hits. He allows 8.5 hits per 9 innings and he has a FIP of 4.76. The bullpen has an earned run average of 4.38 and they have given up 570 base hits on the year. Teams are hitting .253 against the bullpen and they've struck out 537 hitters and walked 253 batters. As a team, Miami allows 9 hits per nine innings while striking out 7.5 batters per nine innings. They are 25th in the league in team earned run average at 4.79. The Marlins pitchers collectively have given up 1,375 base hits and 731 earned runs. They have allowed 183 home runs this season, ranking them 22nd in the league. Miami as a pitching staff has walked 586 batters and struck out 1,149. They have walked 3.8 men per 9 innings while striking out 7.5 per 9. They have a team WHIP of 1.43 and their FIP as a unit is 4.65. As a team Miami is hitting .266, good for 3rd in the league. The Marlins hold a .430 team slugging percentage and an on-base percentage of .329, which is good for 11th in baseball. They rank 3rd in MLB with 9.2 hits per game. Marcell Ozuna is hitting .309 with an on-base percentage of .374. He has 181 hits this season in 585 at bats with 118 runs batted in. He has a slugging percentage of .550 and an OPS+ of 146. Giancarlo Stanton is hitting .280 this year and he has an on-base percentage of .376. He has totaled 158 hits and he has driven in 125 men in 565 at bats. His OPS+ is 166 while his slugging percentage is at .635. 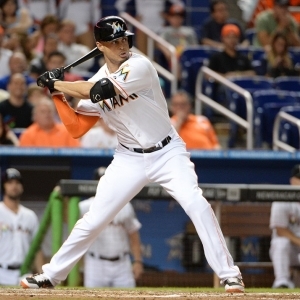 The Marlins have 1,414 hits, including 251 doubles and 189 home runs. Miami has walked 461 times so far this season and they have struck out 1,222 times as a unit. They have left 1,073 men on base and have a team OPS of .759. They score 4.77 runs per contest and have scored a total of 734 runs this year. Colorado has a 83-72 overall mark this year. With an earned run average of 4.56, Tyler Chatwood has a 8-13 record and a 1.44 WHIP. He has 115 strikeouts over the 142 innings he's pitched. He's also given up 129 hits. He allows 8.2 hits per nine innings and his FIP stands at 4.99. The bullpen has an earned run average of 4.34 and they have given up 506 base hits on the year. Teams are hitting .248 against the Rockies bullpen. Their relievers have struck out 528 batters and walked 200 opposing hitters. As a team, Colorado allows 9.1 hits per nine innings while striking out 8 batters per nine innings. They are 16th in the league in team earned run average at 4.52. The Rockies pitchers as a team have surrendered 1,392 base knocks and 691 earned runs this season. They have given up 185 home runs this year, which ranks 18th in Major League Baseball. Colorado as a staff has walked 511 hitters and struck out 1,225 batters. They give up a walk 3.3 times per 9 innings while they strike out 8 per 9. Their team WHIP is 1.38 while their FIP as a staff is 4.34. As a team, they are batting .270, good for 2nd in the league. The Rockies hold a .439 team slugging percentage and an on-base percentage of .335, which is good for 6th in baseball. They rank 2nd in MLB with 9.2 hits per contest. Charlie Blackmon comes into this matchup batting .325 with an OBP of .392. He has 201 hits this year along with 95 RBI in 618 AB's. He maintains a slugging percentage of .595 with an OPS+ of 139. Nolan Arenado is hitting .305 this season and he has an OBP of .370. He has collected 178 hits in 584 at bats while driving in 126 runs. He has an OPS+ of 130 and a slugging percentage of .580. The Rockies as a unit have 1,431 base hits, including 280 doubles and 181 homers. Colorado has walked 487 times this year and they have struck out on 1,359 occasions. They have had 1,037 men left on base and have an OPS of .774. They have scored 5.01 runs per game and totaled 776 runs this season. Who will win tonight's Marlins/Rockies MLB game against the spread?